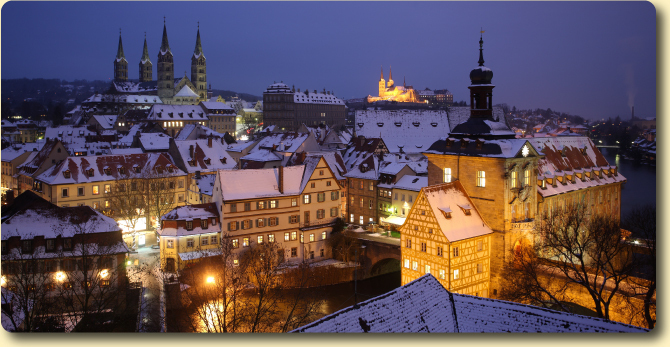 Situated on seven hills, discovering the World Heritage City of Bamberg in the winter months has a charm of its own. 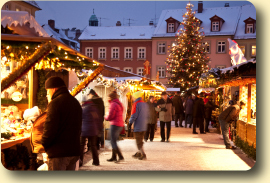 The Bamberg Christmas Market still has a familiar atmosphere and is by no means a mass event. Christmas markets come in four different shapes and sizes in the UNESCO World Heritage town of Bamberg: the traditional Christmas market on the Maxplatz Square, the delightful medieval Christmas market at Geyerswörth Palace, the Advent Market in the Sand and the arts and crafts Christmas market on Jakobsplatz square. 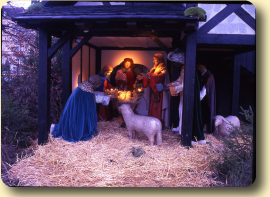 During Advent, Maxplatz square in the pedestrian zone is transformed into a Christmas market, featuring among others, a large Franconian half-timber nativity scene, depicting various scenes from the Christmas story. A mediaeval Christmas market takes place in the inner courtyard of Geyerswörth Palace, featuring a wealth of demonstrations and a mediaeval programme of cultural events. In the Sand - Bamberg's oldest district - arts and craftsmen and women congregate around the mediaeval Church of St. Elisabeth on the first weekend of Advent. 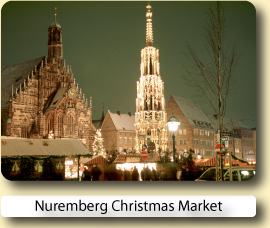 Bamberg's popular "Route of Nativity Scenes" links about 40 churches, museums, public buildings and places with a series of remarkably diverse Christmas cribs and creates a uniquely festive atmosphere as Christmas approaches. Most of these churches and museums are of interest in themselves, but following the „golden thread“ of the trail is a pleasant way of seeking that increasingly elusive „spirit of Christmas“. The imperial Cathedral with its four towers in the city centre is an impressive romanesque building and also well worth a visit. Church music concerts, town musicians and, of course, the New Year's Eve concert by the Bamberg Symphony Orchestra are all music to the ears, creating special and unforgettable festive moments. Every year, visitors from all over Europe come to marvel at these festive events. Bamberg's fascinating historical townscape has developed over more than a 1,000 years. At the centre of this world heritage town is the largest preserved old town quarter in Europe. Around 2,400 listed buildings and the centuries-old garden quarters make up the Bamberg's unique cultural heritage. The façades of its buildings are richly decorated in fascinating detail with spectacular ornamentation. 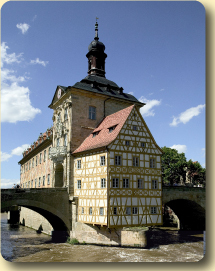 This World Heritage Site in Bamberg was built on seven hills and is often compared with Rome. On one of the hills stands the imperial cathedral with its four towers. Bamberg's Cathedral is the focal point of this beautiful city, it contains the tomb of Heinrich II, an East Frankish emperor. Other local attractions include the old town hall in the middle of the river Regnitz, Little Venice, and the New Palace with its baroque rose garden.15 museums offer further insights into Bamberg's history. Everything worked, no complaints on anything. Easily recommended. Standard Ibis style hotel, clean and comfortable. Good location for wandering over to the old town. 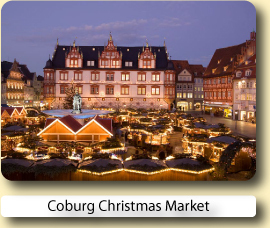 Book your hotel for the Bamberg Christmas Market with Expedia or Hotels.com.Both online reservation services will let you compare and book hotels at great low prices.